SDIV coverage improves to 88%, up from 75% last year. Change to rolling rebalance schedule should mitigate adverse price moves during adjustment. Steady distribution may appeal to income investors, but keep the heavy real estate concentration in mind. Performance has been lagging over global dividend ETFs. Most ETFs are passively managed. The advantage of this is lower fees compared to CEFs, which are actively managed. The disadvantage is that a passive fund will simply own everything in the index indiscriminately. ETFs will nearly always trade close to their net asset value (NAV). The advantage of this is that one does not have to worry about premiums or discounts. The disadvantage is that one does not have the opportunity to buy funds at a discount, nor to exploit the concept of premium/discount mean reversion. 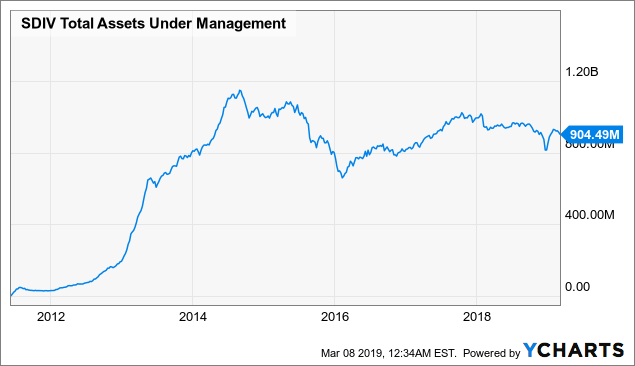 ETFs usually do not employ a managed distribution policy; in other words, they pay out as dividends what they receive as income from their underlying investments. The advantage is that one doesn't have to worry about an ETF overpaying from its earnings, leading to destructive ROC. The disadvantage is that ETFs are generally lower yielding than CEFs. There are exceptions to the above, of course. Some ETFs are actively managed and will have higher fees. Illiquid ETFs may trade at significant premiums or discounts to their NAV, which demands caution when buying or selling those funds. A few ETFs use a managed distribution policy, such as Global X SuperDividend ETF (SDIV), which is profiled in the first ETF Month feature. Just like last year, we're going to kick off ETF Month with Global X SuperDividend ETF, a global high dividend ETF. In last year's "ETF Month #1: SuperDividend ETF Not So Super", we concluded that SDIV offers a managed, monthly distribution of 7% yield but which was only 75% covered. Moreover, we found that the deep value methodology employed by the ETF has hindered its performance vs. its peers. Let's take a look at how the fund has performed since then! The fund currently has $907 million in AUM, down from $1,076 million last year. Its trailing-twelve months (ttm) yield is 8.53%, making it very competitive with the yields offered by CEFs. It is also unleveraged, and charges an expense ratio of 0.58%. The fund website can be found in this link. The average volume of 258K shares provides sufficient liquidity for the average investor. Moreover, Global X ETFs trade commission free at Charles Schwab, E*TRADE or Interactive Brokers. Basic statistics about the fund are displayed in the table below. Investment mandate The Global X SuperDividend® ETF seeks investment results that correspond generally to the price and yield performance, before fees and expenses, of the Solactive Global SuperDividend Index. According to the fund website, SDIV "invests in 100 of the highest dividend yielding equity securities in the world." Let's inspect the index methodology closely to see how the "100 highest dividend yielding equity securities" are selected. The Solactive Global SuperDividend Index has a Bloomberg ticker of SOLSDIV. The selection criteria are reproduced below, with my highlights. Briefly, the index methodology screens for companies with yields of between 6% and 20% (excluding extremely high yield stocks). However, if a company is already in the index, then the lower threshold is only 3%. 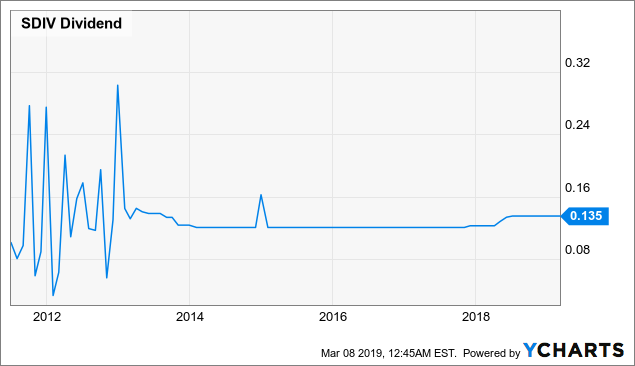 I guess this is so that a company that just barely yields over 6% and is included in one iteration of the index is not then immediately removed if its yield drifts back below 6%. There are capitalization and liquidity filters, as is typical, and CEFs, BDCs, partnerships, and trusts are also ineligible for inclusion. Once we have a list of candidate companies passing the preliminary screen, the selection process is simple. Choose the 100 stocks with the highest dividend yield! To determine the initial composition, the companies in the Selection Pool are ranked in descending order according to their Dividend Yield. The 100 companies with the largest Dividend Yield on that day are then chosen as Index Components. The 100 stocks are equally weighted, so each component will start at an allocation of exactly 1% each time the index is reconstituted. This year, the methodology for the rebalancing of the index has been slightly changed (see "Methodology Change | Solactive Global SuperDividend™ Index | Effective Date 11th February 2019"). Instead of announcing the changes five days prior to the rebalancing date (the last business day of February, May, August and November), changes will be announced 10 days before adjustment. Moreover, instead of the rebalancing taking place over a single day, a five-day-rolling weight implementation (multi-day-rebalance) mechanism will be used. According to Solactive's market consultation document, the reason for this change is to "help downsize the rebalance transactions per day and any potential market impact resulting from the rebalancing." This is very similar to how the ISE High Income Index (YLDA), tracked by YieldShares High Income ETF (NYSEARCA:YYY) and ETRACS Monthly Pay 2xLeveraged Closed-End Fund ETN (CEFL), changed their rebalancing methodology from a single-day to a three-day adjustment in order to prevent rebalancing shenanigans from taking place in less liquid CEFs (as I have previously analyzed here and in the links therein). 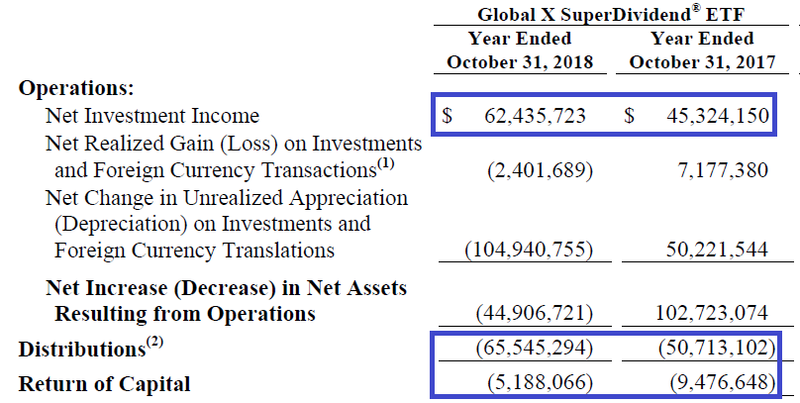 This change is understandable as SDIV's almost $1 billion in AUM, each 1% of rebalancing is going to trigger nearly $10 million in buying and selling of the underlying securities, which could have adverse effects on the share prices of less liquid constituents. Once a quarter, the index is screened for dividend cuts or negative outlooks concerning dividend policy. Index constituents that fail this screen will be removed and replaced with the next-highest yielding components from the original list. Note that the index is not rebalanced to equal-weight during the quarterly reviews. The full list of SDIV's holdings can be found HERE (as of March 8, 2019). The top 10 holdings are reproduced in the table below. What immediately jumps out of the top 10 list is that they are all REITs or mortgage REITs (mREITs)! The top 10 holdings make up 15.13% of SDIV's portfolio, and their weighted average yield is 9.16%. Note that there is no cap on the geographical or sector weights of the index constituents. This had the consequence of loading the top holdings of SDIV with REITs, as the REIT sell-off over the last year has pushed the yields of many REITs. 55% of the fund is in real estate (35% in REITs and 20% in mREITs), and this concentration must be borne in mind by potential SDIV investors. In terms of geographical allocation, over half (54%) of the fund is in the United States. 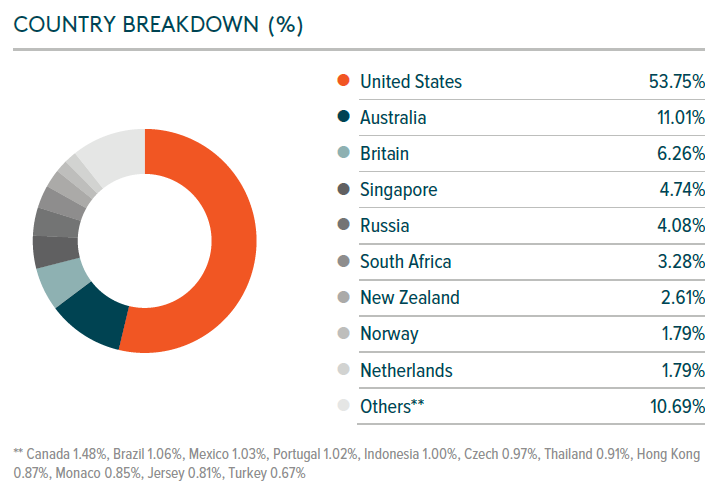 The next three largest countries are Australia (11%), Britain (6.3%) and Singapore (4.7%). A total of 11% are in emerging markets and 1% is in frontier markets. The market cap breakdown from ETFdb shows similar amounts of mid cap (26%), small cap (32%) and micro cap (31%) stocks, while large cap stocks only make up 10% of the index. 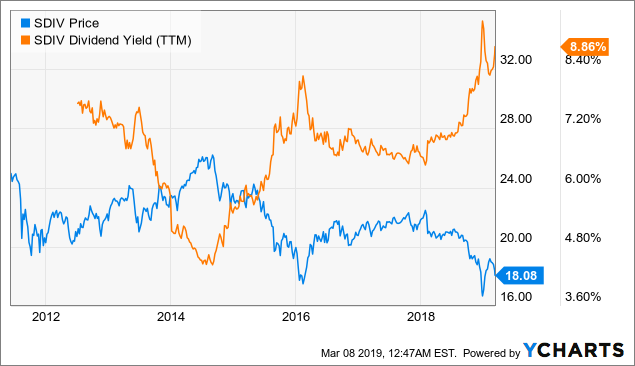 The ttm yield of SDIV has fluctuated between a low of around 4.5% reached during the middle of 2014 and a high of over 9% during the December sell-off. The current ttm yield is 8.86%, which is still very high compared to its historical average. This is due to the aforementioned distribution boost, combined with a falling share price, which has recovered significantly from the December lows but is still at a lower level than during most of 2017 and 2018. How sustainable is this dividend? If we look at the fund's latest annual report (dated October 31, 2018), we can see that the distribution is 88% covered, which is an improvement from the 75% and 79% coverage ratios in the two years prior. We can see that this has been due to a whopping 38% increase in net investment income year on year, while total distributions have only grown by 18%. This suggests that the fund has been rebalancing into higher-yielding securities as fixed income assets sold off in 2018. However, despite the improvement we can see that the fund still needs to make up the shortfall with ROC. 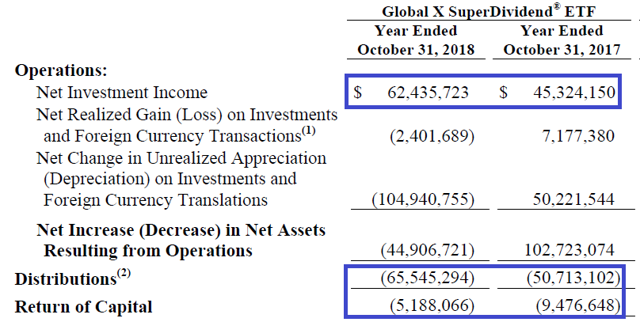 Unfortunately, the above also shows that there was a massive -$105 million depreciation in the assets of the fund in the last financial year, versus a $50 million gain in 2017. A decrease in the share price of underlying constituents should not normally affect the overall yield offered by the fund (in the absence of dividend cuts from the underlying constituents). However, this is not true when part of the fund's distribution comes from ROC. If SDIV has to sell stocks near the lows to make up the shortfall in distribution, future payout levels may be decreased. To benchmark SDIV's performance, let's compare it with the regional benchmark, iShares MSCI ACWI ETF (ACWI), representing global stocks, and three of the other largest global dividend ETFs, First Trust Dow Jones Global Select Dividend Index (FGD) ($492m AUM, 5.40% yield), SPDR S&P Global Dividend ETF (WDIV) ($246m AUM, 4.13% yield), and WisdomTree Global High Dividend Fund (DEW) ($92m AUM, 3.80% yield). 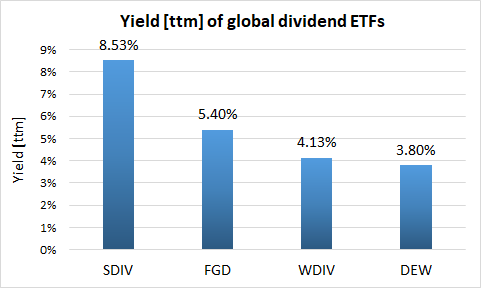 SDIV has the highest yield out of the four global dividend ETFs. (For comparison, ACWI yields 2.03%). 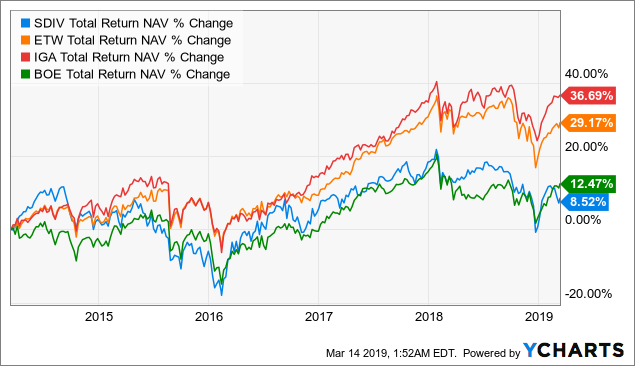 The following chart shows their annualized NAV total return performances over the past 1, 3 and 5-year periods. Unfortunately, SDIV is the worst performer across all three time frames. The above data also shows that global dividend ETFs have generally struggled versus the benchmark AWCI (representing global stocks), with significant underperformance over 3- and 5-year periods. This is probably expected, given what we've seen on the domestic front with U.S. dividend stocks also struggling mightily versus growthier stocks in recent years. 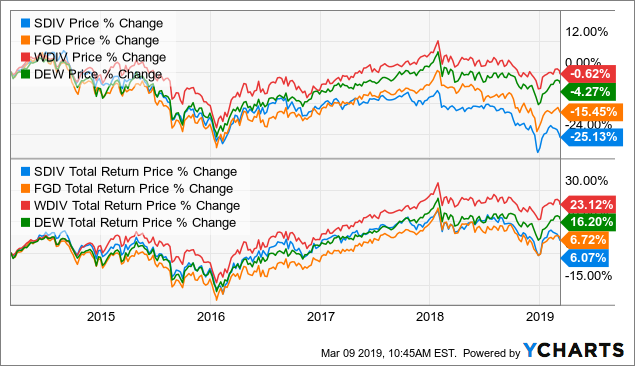 The following chart shows the price and total return price performances of the four global dividend ETFs over the past 5 years. Due to SDIV's above-average yield compared to the peer group, its price-only performance (-25.13%) is by far the worse out of the four ETFs. 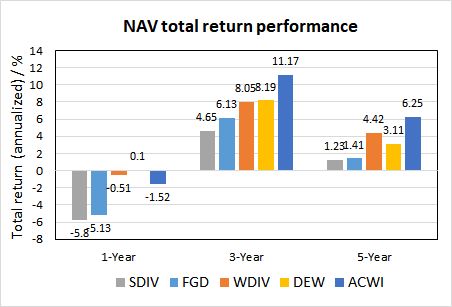 On a total return basis, SDIV's (+6.07%) underperformance is less pronounced, although it still slightly lags FGD (+6.72%) and significantly trails DEW (+16.20%) and WDIV (+23.12%). In terms of volatility and beta, SDIV's metrics are about average for this group of ETFs, according to InvestSpy (data are over the last 6 years). How does SDIV stack against some global option income CEFs? Three representative examples, ETW, IGA and BOE from three different fund managers were chosen. However, SDIV has again been the worst performer over the last 5 years on the NAV level. SDIV's deep-value methodology does give "super dividends". However, investors should be aware that this requires concentration into high-yielding REITs and mREITs, which will increase concentration risk compared to a more diversified dividend fund. 55% of the fund is in real estate (35% in REITs and 20% in mREITs), and this concentration must be borne in mind by potential SDIV investors. This dividend appears to be nearly sustainable, with 88% coverage as of the last annual report. The top 10 holdings have a weighted yield of 9.16%, so SDIV's ttm yield of 8.53% isn't out of the extraordinary. The managed distribution policy of $0.135/month should make the ETF more attractive to investors who prefer a steady income stream, like from their CEFs. However, the performance-wise SDIV has lagged other global dividend ETFs. This is probably not surprising when we consider that real estate has generally lagged the broader market over the last couple of years. Because of this, I would only recommend SDIV as a small satellite holding, but I would not use it as a core position due to its sector concentration and worse performance compared to its peers.